Over the years of developing the road system around the Western Cape a number of contractors have had to build tunnels to get around or through places which would otherwise have made road building in the area impossible. The first such tunnel was built by Bain in Bains Kloof pass way back in 1849. The tunnel which was to be 336 feet long, 12 feet broad and 14 feet high was constructed through a hillside to avoid having to build the road around the slope that was in the way. In his reports Bain describes the work of cutting through the mountainside as "like cutting cheese". To help him with the construction of the tunnel he had 30 convicts doing the digging and with them a bricklayer and a convict helper. It was the bricklayer's job to make bricks bake them in a kiln and then to lay them on the inside of the tunnel walls to support them. Unfortunately during 1849 it rained from April to December, the mud bricks waiting to be baked disintegrated and the tunnel entrance collapsed causing Bain to have to scrap the plans for the tunnel and build the road around the slope they were trying to tunnel through. Both entrances to the tunnel are still visible today. Two more tunnels that have been built by road makers in the mountains still exist and are being used today. The first one is in du Toits Kloof pass near the northern end of the drive through the mountains to Worcester. This tunnel is about a 100 years old and is still used daily by road users in the pass. 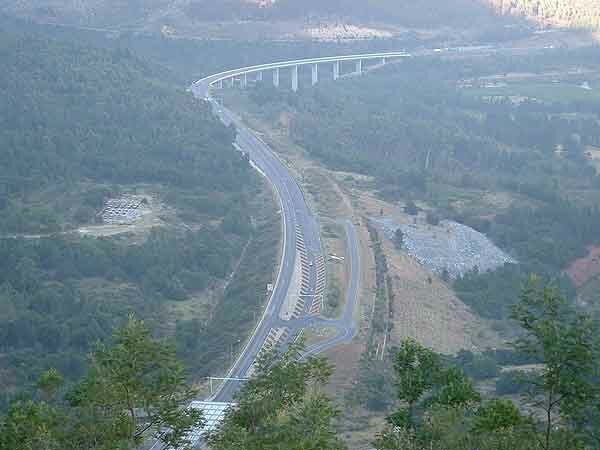 It is about 100 metres long and cuts off a drive around the edge of a slope that would be in the region of about 400 metres long if there was a road. As the du Toits Kloof pass was the most direct route to Cape Town it soon became the road of choice for most travellers. However problems became evident when large trucks started to use it and backed up traffic as they descended the tight bends in first gear. Authorities took note and a suggestion made by a Mr P A de Villiers way back in 1937 of a tunnel through the mountains to Worcester came to the fore. The idea was investigated and accepted and in 1984 work on the tunnel started. Workers drilled and blasted their way through the mountain from the Worcester and Paarl sides simultaneously. During the process a half a million cubic metres of rock was removed from the tunnel and used as a filler for access roads to the tunnel. Some of the rocks were also used in the lining of the tunnel. Incredibly after nearly three years of drilling and blasting the two halves of the tunnel met somewhere in the middle of the mountain with a margin of error of only 3 millimetres. The tunnel which is 3913 metres long was finally opened in March 1988 thus realising the dream of Mr PA de Villiers. 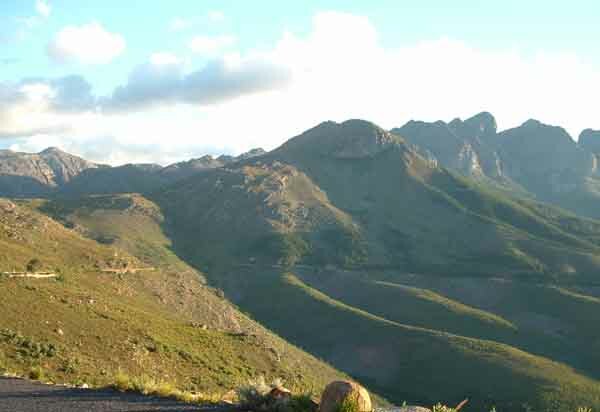 Thanks to the foresight of de Villiers the public travelling through the Cape mountains no longer have to sit behind large trucks making their way over du Toits Kloof pass. However as the Huguenot tunnel is a toll road many truck operators still use du Toits Kloof instead of the tunnel to save themselves a few rand. Those trucks that use the pass still cause the odd jam when descending or climbing the pass but fortunately as the pass is used by fewer vehicles these days the delays are not as bad as they used to be. Most drivers prefer the speed of the tunnel over the views from the pass. The mountains that caused the early settlers to the Cape so much grief have finally been conquered.